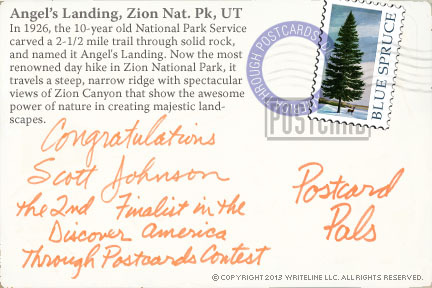 See angels landing in Zion, or rather, Angel's Landing in Zion National Park, Utah -- the Second Finalist in the 10th Annual "Discover America Through Postcards" Contest. 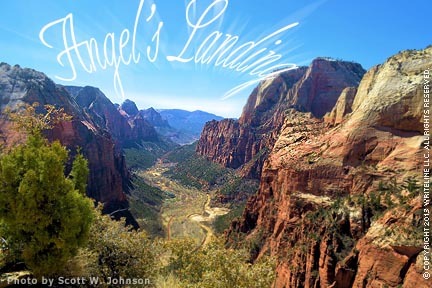 In 1926, the 10-year old National Park Service carved a 2-1/2 mile trail through solid rock, and named it Angel's Landing. Now the most renowned day hike in Zion National Park, it travels a steep, narrow ridge with spectacular views of Zion Canyon that show the awesome power of nature in creating majestic landscapes. In the coming weeks two more finalists will be selected. There's still time to submit one of your photos of any place in the Americas. The deadline is November 15, 2013, 8 PM, EST. Photos should inspire a viewer to want to learn more about, or travel to that place. See the official rules and entry form. All finalist receive the companion book, Discover America Diaries, and the big winner also receives $100. We look forward to seeing your best shots. Copyright © 2013 WriteLine LLC. All Rights Reserved.